Pokemon Crystal is the second in a line of third version games started by Pokemon Yellow. This time around however it's a revisit of the Johto saga. Despite being a third version Crystal introduced several features that are now staples of the series. 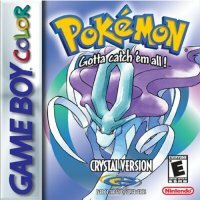 The most obvious feature of Pokemon Crystal is its emphasis on the legendary dog Suicune. The game offers a more in-depth story than its predeccesors, something that would carry on into Ruby and Sapphire and future titles. Along the way several new characters are introduced and a few of the old dungeons receive redesigns. There are also more chances than ever to obtain different Pokemon, whether its by an in-game event or simply because their habitats have changed. There are also new trainers added to routes which you can check out in our Pokearth section. Some of the things Crystal added to the series include: the choice of playing as a girl, animated Pokemon, trainers giving the player items, move tutors, and the Battle Tower. The game has a lot more to it though so use this as your guide to the world of Crystal!